The NASA satellite image below shows the five Great Lakes on a rare cloudless day (August 28, 2010). The lake basins were gouged out by a series of continental glaciers comprised of ice sheets more than a mile thick in places. Over the past 2.4 million years, repeated episodes of glacial advance and retreat have scoured the region. The most recent ice sheet vacated the northern edge of the Great Lakes watershed about 9,000 years ago (see Larson and Schaetzl). As the ice age came to an end, the lake basins filled with glacial meltwater. Over the next 5,000 years lake levels, lake shapes, and drainage patterns fluctuated as the elevation of the land rose with the weight of ice removed, new outlets were uncovered by the melting ice, and erosion uncovered new drainage streams. For example, 5,000 years ago the current site of the City of Chicago was under more than 20 feet of water (see Michigan State University). At that time the bulbous southern end of what is now known as Lake Michigan drained southwest to the Illinois/Mississippi river system. This outlet of Glacial Lake Chicago was abandoned about 4,000 years ago as the current level of Lake Michigan was reached. The lakes that remain today represent the largest group of freshwater lakes on the surface of the planet. Collectively, the Great Lakes represent roughly 18% of Earth’s surface fresh water that is not frozen. The five lakes form a truly interrelated system due to their watery connections. Although new channels have been dug and natural channels have been modified by man, the Great Lakes remain connected to the sea in much the same configuration as the glaciers left them. Lake Superior is the highest in the system (see TEACH for a profile). It empties through the St. Marys River into Lake Huron which is 20 feet lower. Lake Michigan is at the same elevation and is connected to Huron by the deep Straits of Mackinac. The three upper lakes drain through the St. Clair River, Lake St. Clair and the Detroit River into the first of the lower lakes only 8 feet below, Lake Erie. The largest drop (325 feet) is over Niagara Falls in the Niagara River connecting Erie with Lake Ontario. From there the system drains into the Atlantic Ocean through the St. Lawrence River. As the name implies, Lake Superior is the largest of the five on nearly every measure of size (see NOAA). By volume, Lake Superior contains more water than the other four combined due to its large surface area and quarter-mile depth. Lake Michigan is the second largest by volume but Lake Huron is second by a small margin in surface area. Of the two smallest lakes, Erie has the least volume due to its shallow depth even though it is quite a bit larger in surface area than Ontario. Ready access to this huge water supply has encouraged the growth of large population centers. The region encompassed by the image includes 25% of the Canadian population and 10% of the U.S. population. Nearly 34 million people live in the basins of the five lakes, led by Lake Erie and Lake Michigan, each having over 12 million people living in their tributary areas. Humans use this water for drinking, recreation, agriculture, transportation, industrial processes and waste disposal. As one might expect, conflicts among these uses abound. Environmental threats include uncontrolled pollutants from urban and agricultural runoff, effluent from industrial processes, and the introduction of invasive species. The opening of the St. Lawrence Seaway and the construction of the Welland Canal around Niagara Falls were major contributors to the introduction of invasive species into the Great Lakes. These constructions allowed ocean-going vessels to penetrate the Great Lakes all the way to Lake Superior. Ballast water in these ships contained many exotic species from around the world. Sea lampreys, round gobies, zebra mussels, quagga mussels, and Eurasian ruff are some of the most disruptive species that have invaded via this route. 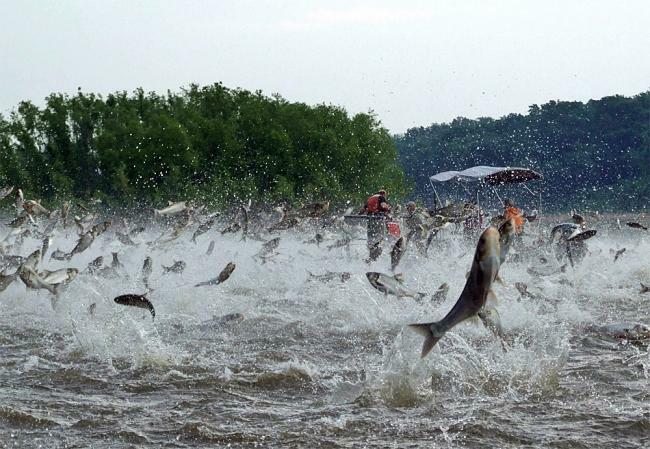 The possible introduction of Asian carp into the system represents a threat that has received a lot of attention lately. This exotic species has worked its way up the Mississippi and Illinois rivers into the Chicago region. Under natural conditions, these rivers had not connected to the Great Lakes since the days when Glacial Lake Chicago drained in that direction. With the completion of the Illinois and Michigan Canal in 1844 and the Chicago Sanitary and Ship Canal in 1990, man-made connections between the Great Lakes and the interior river systems became well established. Though useful for transportation and wastewater removal, these artificial waterways present another threat to the Great Lakes system by providing an additional conduit for the introduction of invasive species.